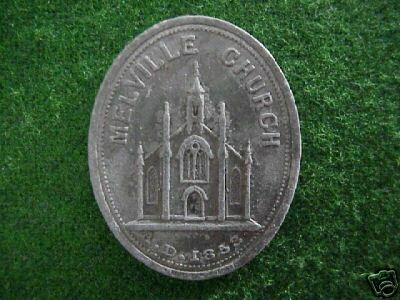 Communion tokens were most notably a feature of the Presbyterian Church in Scotland. They were used not only in the Established Church but by the various Secession and Free Churches, the Episcopal Church in Scotland, and occasionally others, such as Methodist and Wesleyan. Scots took the tradition abroad with them, and significant numbers are recorded from Ireland, England, Canada, the USA, Australia, New Zealand and elsewhere. There were variations in procedure, and in later times the strictness of the early days was seen as less appropriate, but tokens continued to be used. To be refused one was a matter of great shame in a small community. The original purpose of the tokens was to identify those considered worthy to take part in the communion service, and to prevent those not well instructed in the faith or not of good character from approaching the communion table. In times of persecution, tokens served to exclude strangers and possible spies from the open air conventicles, when this could be a matter of life and death. In the early days, discipline was strict, and celebration of Holy Communion (once or twice a year, but sometimes at much longer intervals) was an important part of life in Scotland. Later the communion season became a great social and religious gathering, continuing from preparatory services as early as Thursday, through to thanksgiving on the Monday. When farm servants in Scotland were engaged they would sometimes bargain for time off to attend. The kirk session and minister decided who should get the tokens, which were handed out by the minister at the preparatory service or distributed by the elders. On occasion the communion service could last all day, with several ministers serving great numbers at a succession of ‘tables’. Communicants surrendered their tokens usually at the entrance to the table, or when seated, taking their places at the sitting shown by the table number on the token. Table numbers could also indicate different locations in the church when it was possible to seat everyone at once.